There's an arresting moment early in Michael Wolff's Fire and Fury in which Steve Bannon explains the mechanics of alt-right politics. Aides are nonplussed by the timing of the Trump administration's immigrant ban, imposed on a Friday night, a moment of maximum inconvenience and exposure; timing that all but guarantees emotionally charged chaos and a hostile press. 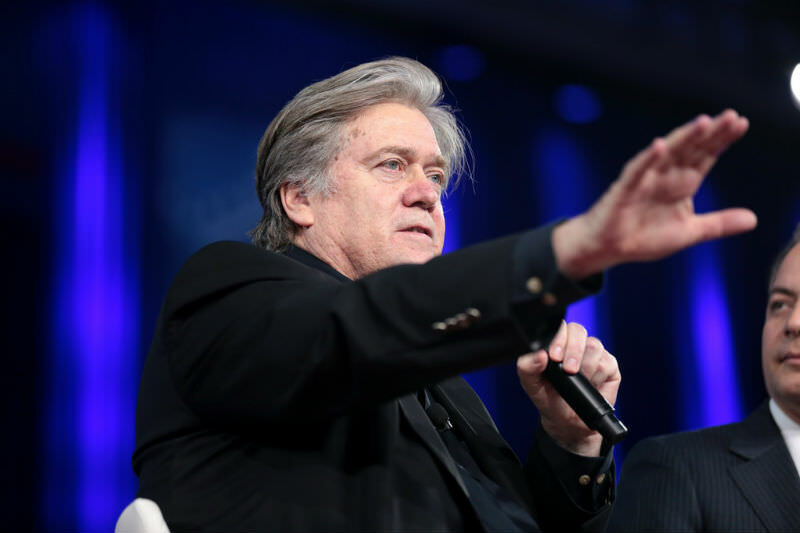 'But Steve Bannon was satisfied,' writes Wolff. 'He could not have hoped to draw a more vivid line between the two Americas — Trump's and liberals' — and between his White House and the White House inhabited by those not yet ready to burn the pace down. Here we have a quick demonstration of a new political method. It's not designed to advance any particular policy position, the routine of conventional politics. The point of this new politics, this politics of the social media age, is trolling: the simple art of using rhetoric and political acts to provoke a reaction. Suddenly a lot makes sense. Tony Abbott makes sense. Donald Trump makes sense. So much of social media makes sense. The politics of the new right is a deliberate, calculated provocation. This is strategic of course, playing to an angry base while upping the ante of political rhetoric, marginalising opposing voices by pushing them to greater extremes. "Just as politics now stoops to empty — but cynical — emotional manipulation, the media who campaign in parallel are doing something equally cold and calculatedly opportunistic." This is a political position only made possible by the acquiescence of a media class caught between worlds, a media that trades on its historic reputation for fairness and a pursuit of objectivity while acting often to push a political line, either because of its own political convictions or purely for populism and profit. The challenge stands: if a political utterance is demonstrably false, or overtly and emptily provocative, what is the media responsibility to interrogate it and place it in appropriate context? We're not stuck for examples. A minister of the crown, a voice that carries the time-worn authority of government, insists that the people of Melbourne are so terrorised by African crime gangs that they dare not walk the streets at night ... how should this be reported, this demonstrable, cynical falsehood? It's a question fundamental to our moment. If media is being played by politics, how ought media respond? If goodly chunks of the political discourse are intended simply as provocative hyperbole, how should that hyperbole be relayed ... if at all? With the simple straight face of conventional he said, she said reporting? Or should it be filtered or contextualised? And who makes those judgments round what is empty hyperbole and what is reportable assertion? The problem is that routine reporting places charged hyperbole and downright falsehood on a level playing field with measured statements of fact. There are examples beyond measure of political media reporting cynical misinformation with the same sense of gravity it applies to rock solid fact: 'there is a debt and deficit emergency, he said', 'the government, if re-elected will privatise Medicare, she said'. If politics — professionalised, knowing, cynically manipulative — plays on the press's compulsion to report and thus validate the outrageous for purely political purpose, what responsibility does the press have for the consequences of that validation? The interdependence of politics and media goes beyond the new right's outrage baiting. Press and politics form an increasingly interrelated realm: it's not for nothing that we have framed a contemporary notion of the political class that embraces both politicians and media. This ought to work well enough, but events have conspired to make it at best a dysfunctional relationship, at worst something that actively poisons the public sphere. The recent African gangs story is a grotesque example of how media and politics work almost in collusion. At best the story is a rolling description of a political position; bad enough because that position should at least be interrogated. Worse, it's media acting as a like-minded accessory to a position that is a thinly veiled dog whistle to both prejudice and fear. Worst, it's media, like the Herald Sun, acting as the active instigator of a misrepresentation of reality calculated to have a social and political impact. The press has always acted from time to time as a campaigner or advocate, championing issues of policy, politics and morals. The emptiness of modern politics puts the campaigning news organisation in a new light though. Just as politics now stoops to empty — but cynical — emotional manipulation, the media who campaign in parallel are doing something equally cold and calculatedly opportunistic. The newspaper, for example, that exaggerates crime statistics to promote a crude political position does nothing more than lie in order to provoke fear. It's the worst possible betrayal of public faith. The 2018 Edelman Trust Barometer showed a continuing global decline in trust in institutions, a discomforting hallmark of our moment. In the thick of all that, the public faith in journalism showed an uptick, set against the continuing decline in faith for media outlets. The sense here is of a public yearning for something more, something truthful that it can trust. That's journalism's continuing challenge. Jonathan Green is a writer and broadcaster. He is editor of Meanjin. I appreciated this thoughtful piece. Any thoughts on the answers? Maybe we should be interrogating the Press immediately before we write our furious letters about the content of the story. "What's your take on the PM's reason for this statement"? "What's the background and context of this federal politician's intervention in a State's affairs"? Of course, we have to have a bit of distance, a bit of self control and insight - and we need to believe that even if our letter isn't published, sheer numbers can be having an effect. Our letters, reasonable, polite, clear, will be too boring for publication - they only love us when we're crazy! The new “mechanics of alt-right politics” and the strategies of Steve Bannon are about a hundred years behind the alt-left. In 1915, Lenin recognized the propaganda talents of Willi Munzenberg. Munzenberg and Goebbels both served in the Reichstag during the Weimar Republic. Goebbels regarded him as “a nemesis but learned the dark arts of media strategy by watching him work.” Munzenberg appreciated the dual role of the propagandist. Firstly, the masses could be deceived by bread and circuses, chanting crowds, etc. But secondly, “We must organize the intellectuals” he told the Comintern. Goebbels succeeded at the former but not the latter. Munzenberg created a network of front organizations and fellow travellers. His publishing network used every resource: newspapers, film, radio, books, and theatre. Every kind of ‘opinion maker’ was involved: writers, artists, actors, commentators, priests, professors, business leaders, scientists, psychologists. In fact anyone at all whose opinions the public might respect. He pioneered the “Press Agency” where legitimate journalism from independent writers and sources would be placed in legitimate journals, while at the same time placing fabricated stories. In 1932, Walter Duranty of the New York Times won a Pulitzer Prize for his largely fabricated stories about the Soviet Union. I participated in a survey of 'Age' readers re the Coloured gangs. It asked the question something like this,'Have you felt fearful of gangs in your area; have you been accosted?' The overwhelming response to this question published in 'The Age' was ' no' in a small article. Wouldn't it be good for this response to be published maybe on the front page or at least in a more prominent position. Surely the newspaper could do some journalistic research to refute false information. Thankyou JG- brilliant insight. My fear is that we all get sucked into this hyerbole. It is like the flu spreading across the community. The Dutton comment on Melb Folks too scared to go out line is perfect example. From my perspective Melb folks made such a joke of it that the original nastiness lost its potency. What do others think- is humour and redicule a possible counteracting force? Great essay. Thank you, Jonathan. Great comments too. When Donald Trump was campaigning to be POTUS, the stand-out shot of rhetoric from him as far as I was concerned was his claim that he could walk down the street and shoot someone and people would still vote for him. It was so far over the top that it almost made me dizzy. I found him beyond loathsome. This essay has helped me to understand how it all happened. Good to get some historical perspective from Ross too. Thank you for an excellent summary of the collusion between politics and the media. This has existed in some form for a long time, but is shriekingly obvious at present - and let's not forget the way Trump has used Twitter, unmediated by editors (but that's another story). But let's look at the way recent examples have rebounded on their perpetrators - Bannon is gone, Scaramucci is gone. On the media side, trust in some major outlets has sunk pretty low. All depends on enough people swallowing the lies put forward by politicians through their medium of choice. Alternative media such as Buzzfeed are expanding, programs like Q&A have considerable influence - can we be a bit optimistic and think the tide may turn against those who lie and conceal important information? Ross Howard is quite right. The tactics of "fake news" is of both Left and right, but started on the Left. Not just the out and out Communists, but very much too the neo-Marxists coming out the Frankurt School in the 1920s. Their tactics for 80 years has been to undermine all established and stable social institutions (Churches, marriage, families, sexuality etc), manipulate any group with a potential grievance, exaggerate and make emotive potential community problems (forestry policy, pollution, etc etc), and never be satisfied with compromise. Push until it breaks; bring it all crashing down. Sounds familiar? Those who write that fake news started with the left may or may not be correct. It would seem that lies have been employed by those in power for much longer than the past century. In any case, there have been various swings of the power pendulum across the past century. It seems to me that the capacity and the right to define truth, (like history), is claimed most vehemently by those who exercise power. “The politics of the new right is a deliberate, calculated provocation.” And the Trump assassination chic of the current left isn’t? Logs to the left, slivers to the right. Hadn't you noticed Jonathan. It's left right and centre. We live in an age where access to news is now so diverse that a person can choose an ideological slant that best suits their perspective on the world. Many people , particularly the tech savy young , don't watch the TV News or read newspapers. Anyone can publish online regardless of the truth so as POTUS put it 'fake news' is all around us. Propaganda has been around for ages although the Soviets and the Nazi machine made it an art form .Today Putin's Russia used it spectacularly in the US Presidential election. Cutbacks in staff in Newspapers/Radio/TV has not helped with a lot of nonsense getting past the sub editors now. Thanks Jonathan for your thought provoking article.